A: I am told that as a toddler I tried to break everything I got hold of. Early on I was given a truck that simply couldn’t be broken and since then, I have had an irresistible urge to make things. By the age of 8, I knew somehow that I wanted to be an engineer and this led naturally into woodwork as a hands-on expression of this feeling. By my late teens, I had the confidence to build a 16ft sailing boat. A: James Krenov stands out for me as somebody whose writings have inspired me to think about design and to use hand tools to achieve fine details and a quality finish. Recently, I came back from 2 years of living in Tokyo where I had a wonderful woodworking experience through an association with Shuko-kai, a group that promotes traditional Japanese woodwork. In many respects, the atmosphere of camaraderie in the group could have been transplanted from a western group of woodworkers and they have a wonderful focus on building skills and knowledge with hand tools. I attribute these attitudes and the focus on traditional tools and methods to the mentor behind the group, Tokio Inoue. So he also, is a hero of mine. He also showed the patience of a saint in the way he helped me with some of the early articles that I wrote while still in Tokyo. A: I think I am a bit of a woodworking butterfly in that I have sampled a wide range of woodwork over the years—boatbuilding, carving, furniture, cabinets, small boxes etc. In Japan, I did most of my woodwork on a bench I could mount over the kitchen sink (we had a small apartment by western standards) and this automatically focussed me on smaller objects. Going forward, I think I will keep this focus. I can see additional things I want to achieve in finding a western interpretation of the Japanese box tradition. In addition, I have been experimenting with small structural forms in moulded veneer and can see a number of projects there as well. A: I think that a solid grounding in the use of hand-tools is essential to finding a good balance between hand and machine tools. These days, I think that there are lots of new hand tools that are every bit as good as the original models they replicate. I have a preference for Japanese tools and fortunately, craftsman-made Japanese tools are still available. I use a vernier caliper a lot for fine woodwork. While a traditional caliper is sufficiently accurate, I find a digital version somewhat easier to read. The other digital incursion into woodwork is 3D CAD. I currently use Google SketchUp to model my projects and to produce sketches and final drawings. It has lots of advantages for visualising and for updating projects as the design evolves. A: I dislike artificiality and like to find minimalist designs where the form is driven by the function. A: If I wanted to get off the island, I think that I would have to go for a chainsaw. However, my favourite tools are hand planes, though I’m not sure what I would do with a hand plane on a desert island. A: I’m pretty happy with the mitre box-in-a-box that I submitted to the AWR Open Box competition*. It captured a lot of ideas from Japanese woodworking while also displaying a western style. A: The best excuse I’ve heard was from the craftsmen who built one of the temples at Nikko in Japan. They felt it was so perfect that the Gods would be jealous, so they intentionally (?) put one of the pillars upside down. I haven’t tried that one yet. A: One of the good things about woodwork is that you can learn from your mistakes—so my most often-made mistake is a moving feast. Precision woodwork depends on accurate mark-up initially and I think that’s where most of my mistakes occur. A: The tradition at Shuko-kai is that members learn on the more malleable white steel blades. When I eventually graduated to a harder blue steel blade, I managed to crack it while adjusting the back. I then had to take it back to the master—Tokio Inoue and together, we ground ten years life out of the blade in order to fix it. Very embarrassing. A: Golf would be boring if it was easy and everybody could do it well—so would woodwork. Wood is a complex and variable medium and that’s what I love about it—okay, wood that doesn’t move or tear out would be great. A: There’s a lot of boring woodwork out there. 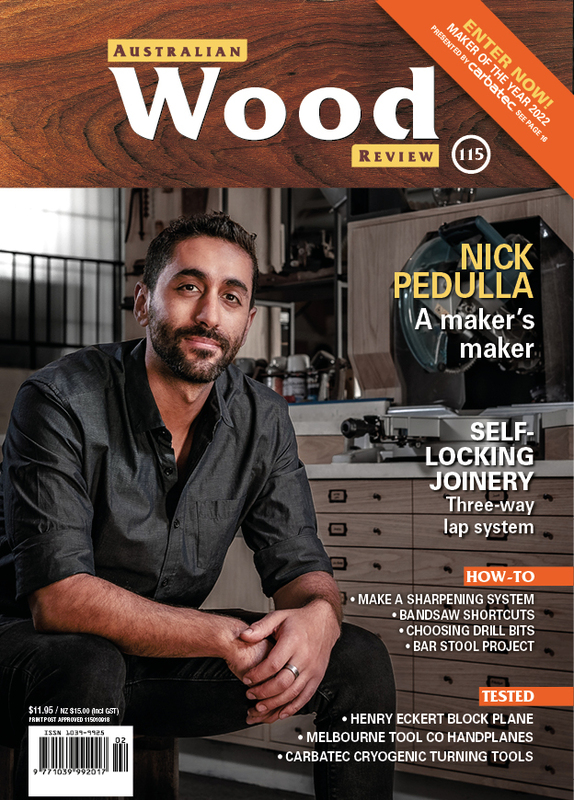 I’m not sure whether this means that woodworkers need to spend more time on the design phase or whether buyers need to value good design more—maybe both. A: Woodwork is a journey and I am enjoying the journey. It would be great if I was further down the journey but I am where I am—I just hope the journey keeps going for a while. A: I am happy if I can design good solutions to everyday problems—and in doing so, make something that somebody else will value and enjoy while they use it. * Iain Green writes about making the box in AWR#61, p.46.